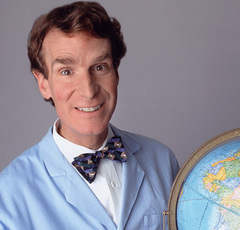 His show stopped producing new episodes nearly eight years ago, but it seems that Bill Nye the Science Guy (Bill! Bill! Bill! Bill!) isn't submitting to B-level TV-celebrity status just yet. A mechanical engineer who studied at Cornell under Carl Sagan, Nye has much more under his belt than his beloved educational show; he engineered a hydraulic device for Boeing that is still used on the 747 and a special sundial used during the Mars Exploration Rover mission. It's indisputably ethical to oppose intelligent design; philosophy can not be brought into the class room as a scientific theory. If a hypothesis can not be proved using the scientific method taught to elementary school students, how can it be considered a potential contribution to scientific knowledge? Actually, it sounds like "criticized" may be too strong a word: the article I read from Waco made it sound more like he was simply using a Bible verse as a springboard to make a point. It's easy to believe, though, that he meant to be a touch provocative-- a skill many teachers employ in making their lectures interesting and memorable. Sounds like he made his point rather effectively! Nothing with any intelligence would design a head that looked like Bill's. "philosophy can not be brought into the class room as a scientific theory. If a hypothesis can not be proved using the scientific method taught to elementary school students, how can it be considered a potential contribution to scientific knowledge?" This is in itself a philosophical statement. The idea that the scientific method is the only arbiter of truth is a philosophical statment. no, the scientific method -literally- defines science. There is no philosophy about it. If it follows the rules of the scientific method, it is science. If it does not, then it is -not- science. All they really need to do is have kids read both like I did and make their own opinion. By forcing "Intelligent Design" on kids as the only truth is to force a religion. Also to those who really think about it a Christian can say that "God" started the "Big Bang" thus both can be right and the fight ended. Yet that is too easy so we have to make sure this fight never ends otherwise how would we pick our leaders. by their policies? but we are so used to it being intolerance and petty things. "The idea that the scientific method is the only arbiter of truth is a philosophical statment." Using a rational sentence to propose that an unscientific method might be another arbiter of truth is truely paradoxical. Well done, you've just stuffed up your own argument! But if you know of an irrational system that holds more "truth" than science, then I'm all ears. Don't get me wrong, it's a funny joke indeed, but maybe it's not good to confuse the children like this. (an unscientific method must have at least one irrational statement within it that will contradict itself somewhere along the line QED). If you believe in evolution, then tell me how co habiting things such as plants with flowers and pollinating insects..
therefore how did they come to "evolve"? Why would a flowerless plant become a flowering plant that required more energy(previoussly aesexual) and the symbioses of another organism (and its energy) to be sustained? How did one come into being without the other? What would drive them to change if the other wasnt already present? Which came 1st? Evolution cannot solve this problem, and yet many such problems as these are highly disregarded and ignored by "scientists".. yet they teach it as if it were facts. Well, lets talk a little bit about intelligent design. Think about this: Take a look at a car. And think about it. Is it evolved? There are thousands of people's effort on it to come to that level. It is constantly being inprovised on a previous design to get to the level we see it now. So, in a way it has evolved. But also, there are people behind what we see as a car. Now, look at human beings and this world. A singular species which have domintaed the earth, if just pure evolution alone, where are the rest? Think. If you think long enough, it is hard not to come away without the doubt of an intelligent design behind it. Taking bible literally, yes, it sounds bogus. Then it is like trying to intrepret calculus by a kindergartner. If someone has to understand Bible, they need to get to a level they can understand it, if not, it is gibberish to them. I invite you to read the book ' Second Coming of Christ' by Paramahamsa Yogananda, and you should get a glimpse of what Bible is about. I am not saying I know anything, with my limited brain, when I think, and when I look at my forefathers from my country and what they have contributed to the world (I am from India), I don't think all that folks have nothing much to do but to say all that and it is all fiction. I think our 'scientific enquiry has just begun, and we see remarkable progress in our approach, and now the new world seems to run based on the benefit of the research and advancement we have thought of. But I believe there is a lot more. A lot, lot more that we don't understand. Like death. Just think, you should feel what I mean, if you spend enough time thinking about it. Anyway, my humble 2 cents. "Certainly in many primitive human societies, religion allows the people to deal with phenomena that they do not adequately understand." We are not primitive? I must have missed that memo. Regarding the flower and insect, and any other not-fully-understood systems query. It doesn't matter if we can't explain something right now. It's not science's role to know everything right now. Science is a process not a result. If we don't know how something works people can use the scientific method to try to determine how it works. If something is overlooked or the inital hypothesis is flawed then you don't accurate or useful results. In any case, whatever has been shown by the scientific method is bound to be a great deal more useful than anything the bible has to say on the topic. pnt blnk: Just because they don't have an answer for everything all at once doesn't mean their ignoring it. Unlike intelligent design which explains everything all at once the scientists have a hypothosis which a lot of evidence supports, that isn't all going to come at once. Theres recently been found evidence of anteaters before ants existed, yet now they only eat ants... it's not known what they ate before ants but they must have eaten. They existed before but a better food source came along. Plants polinating via wind may have been around before polinating insects, when the polinating insects came along the plants could evolve to be more specialised. I can't resist. I love debating science with kids that have read a couple freshmen level books on philosophy, but don't understand the simple terminology. We teach our children untrue things as fact? Try explaining imaginary numbers to a child just learning how to take a root. It took mathematicians a couple hundred years to work out that one. Or explain how a large portion of the Holocaust was designed by pediatricians. Why can’t I divide a number by zero? We don’t teach necessarily lie about these topics, we simply don’t tell them the whole truth all at once. There are numerous research projects concerning evolution every year. I have a few masters degrees and most of it goes over my head, so how can we expect children to cope with it. As for debate, I absolutely agree. However, the students should question the research on scientific grounds, not simple “I don’t like how it fails to explain everything” grounds. Which brings us back to understanding simple terminology. Now, in case you didn't get this in elementary school science, theories change over time as new data is analyzed and better models are developed to explain the data. Science is based on fact, changes with new data, and offers models to make reasonable and useful predictions about nature. Religion, however, does not. Even if you grant intelligent design fanatics everything (and I wouldn’t suggest you go along with some of those crazy ideas), you gain no useful predictions with it; therefore, it is of no scientific value (e.g. not science for those keeping score). Of course, proper philosophical argument would be a bit more verbose, but I’m lazy. Just look at what intelligent design is—religion. Throughout history, religion has relied upon fear and oppression to gain control over societies. You think Socrates wanted to drink the poison? Galileo just couldn't stay out of the lime light and didn't really care for the Pope anyway? The theory of evolution is our best guess given the data. Intelligent design is a way to inspire fear in the under educated (bad science teachers maybe) and give the truly despicable power. Nothing is certain in science, but in society under-educated masses controlled through fear by power hungry fiends always leads to oppression. We don’t really understand gravity or time or much at all about medicine or space, but that doesn’t mean Newton and Einstein and Pasteur are completely bunk… the just didn’t have a complete truth. So we teach our children what we’ve learned so far in the hopes they’ll fill in the blanks and take the next step. Don’t stifle generations of innovation and science because you don’t like what they have to say—there has been enough of that in history already. 1. One can not create energy. 2. One can not destroy energy. 3. The Universe has in insatiable lust for irony (Douglas Adams knew it best). 4. The first two are still up for grabs. Bill Nye is looser than what? Lol I used to love Bill ! Christians have always wanted total exclusivity in their thinking, and by extension and of course the total arogance of the viewpoint, everyone else's. In China there were, for thousands of years, a multitude of beliefs that existed in harmony with each other, Taoism and Confusianism are not mutualy exclusive. And neither are Christianity and Science. Only fundamentalists (of which the key part of the word being mentalists...) are so closed/narrowminded they are unable to accept anything except their own philosophy. Intelligent Design is not, has never been, and cannot be considered a viable scientific theory. The idea that it should be offered up in a science class, as oposed to philosophy/theology classes is just laughable. It shows a total lack of comprehention of the scientific method on the part of the Intelligent Design proponents, or a deliberate and possibly malign one. The sinister thing is that they manage to find enough people, uninformed or fanatical enough to make so much noise that this nonsense is taken with anything more than a pinch of salt. It is, above all else, a sad comment on the state of the education systems in place in the west. "I can't see how flowers and insects could each possibly evolve into the symbiotic relationship they have today... so it can't be true". "I can't see how part of a bacterial flaggelum or part of an eye could be of any use so evolution must be wrong and we have 'irreducible complexity'"
Just more examples of simple- or lazy-minded people who want the truth to be black and white and served on a plate. Science isn't easy - if you 'don't get' the Scientific Method, face up to your own shortcomings, read the relevant literature and educate yourselves. I believe in order for us to harness the power of fire and the wheel, and later ones and zeros, we needed an active (overactive) imagination. While this has obviously worked in our favor, the side effect is the insatiable need to answer any question laid before us. This at least partially explains why seemingly all civilizations have some sort of religion. Just because you can't understand a process, doesn't mean it's bunk. Regarding your bees-and-flowers question, at least I gotta congratulate you, it's a new example for the old "irreucible complexity" fallacy that ID'ers love so much. At least it's not about watches and watchmakers this time. - remember that those insects from the first tip probably did not depend SOLELY on polen, as well as the flowers did not depend SOLELY on those insects to survive. Christanity is not based on exclusivity. Like any experience, you meet one of a group and assume the entire group is just like that one you met. Soory but it's not true. Science is a religion. Using science you can not tell the future with 100% accuracy. So if you drop a ball 1000 times and it does what it "should" does that mean it will do the same the 1001th time. Now think real hard on the one. Can you say 100% that it won't just hover in front of you? Nope! So welcome to a faith based religion man. Faith in reproduceable results. OK continue the ignorance based flame war. Bill Nye could crush you with a thought. "Science is a religion. Using science you can not tell the future with 100% accuracy. So if you drop a ball 1000 times and it does what it "should" does that mean it will do the same the 1001th time. Now think real hard on the one. Can you say 100% that it won't just hover in front of you? Nope!" Well, someone else who does not understand what science is all about. What you are talking about is trial and error - not science. Dropping the ball (or an apple, if you remember your history lessons) is not producing a scientific result - it kicks off a process of thought - which in turn may lead to a scientific explanation of gravity. Once I have an explanation for gravity, I would not need to drop anything anymore, because I know it will fall to the ground each and every time - unless the environmental conditions change. Therfore if the ball would hover in the air in front of me, it would again start me thinking and analyzing what changed to make the ball behave differently this time. Most likely I will find out, that the original assumption - objects fall in the presence of gravity - is still true. If it is not, then it is still in concurrence with the scientific method to modify the paradigm to take account of any additional factors. E. g. just because gravity is present and a ball hovers in front of me, is not going to change my mind if I find myself in an airplane flying a parabolic curve. Using the scientific method, I would find out, that even though gravitational forces are counteracted, my orriginal assumption about objects falling in the presence of gravity is true. And no, science will never be able to predict 100% of all future events. Simply because of the complexities involved in explanation. Which sort of leads us directly into chaos theory, which will be really hard to accept or understand for the religious faction amongst you. You will probably never be able to forgive me. But saying: I do not understand what goes on around me, therefore there must be this guy who is omnipotent, omniscient, omniwhatever, is certainly not scientific. In fact, to me it is just plain stupid. Nevertheless it is probably the one, last thing able to keep a feeble mind from going insane in this complex world of ours. So keep your religion, but do not try yourself on changing scientific paradigms - it is a rediculous effort.